Preheat the oven to 350°F. Grease two standard-size doughnut pans (12 wells in total) with butter or non-stick cooking spray. In a large mixing bowl, combine flours, sugar, baking powder, salt, baking soda and nutmeg. Whisk together to add air to the mixture. With an electric mixer or pastry blender, cut in the butter until the mixture resembles coarse, sandy crumbs. In a medium bowl, whisk the eggs until frothy, then gently whisk in the sour cream and vanilla. Fold the egg mixture into the flour mixture and whisk until just combined. Fold in the sprinkles until evenly distributed. Using a spoon and spatula or a piping bag, divide the batter among the 12 doughnut wells. Do not cover the center. Tap the bottoms of the pans on the counter to eliminate any bubbles. Bake for 10-12 minutes or until a cake tester or toothpick inserted comes out clean. Cool the pans on wire racks for 5 minutes. Turn out the doughnuts onto the wire rack to cool completely. 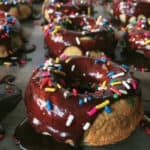 While the doughnuts are cooling — in a small saucepan over medium-low heat, combine chocolate, cream and espresso, stirring until chocolate has melted. The mixture should be thick and smooth. Whisk in the confectioner’s sugar until the mixture is smooth and very warm, 30 seconds to 1 minute. Do not simmer. Remove from heat. Spoon glaze over doughnuts. Top with sprinkles. Allow glaze to cool slightly before eating. Store in an airtight container up to 3 days. Best eaten warm. If you don’t have cake flour, you can make a substitute. Adapted from Joy the Baker: Measure out 1/2 cup of all-purpose flour. Remove 1 tablespoon of all-purpose flour and discard or save for a later use. Add 1 tablespoon of cornstarch. Sift flour 5 times. Recipe loosely adapted from A Baker’s Field Guide to Doughnuts: More than 60 Warm and Fresh Homemade Treats by Dede Wilson.